Long before Disneyland and EPCOT center, there was Parlor Rock. Built through the forces of nature and developed by an abandoned railroad company. Parlor Rock became a popular picnic grove and one of the countries first amusement parks. This once popular turn-of-the-century destination faded into oblivion to be forgotten in the flow of time. How is it that Trumbull, Connecticut boasted an entertainment complex before the rest of the country discovered the importance of such an industry? What was it like? What did it look like? Why was it built?, and why did it vanish from existence? On November 20th, 1797 the Town of Trumbull was incorporated. As the Town grew and developed, the land began to be restructured by man. The Indians who existed with nature relinquished their ten thousand year rein to a people who will alter the land. Industry sprang up along the Pequonnock River where its power could be harnessed. The forest was converted into farm land. Taverns, mills, mines, factories and stores were added to the topography. The original Indian trails were expanded into roads to criss-cross from farm to farm. Turnpikes enabled farmer's to get products to market. To change the land as we described, required long hours of work from sunrise to sunset. As work expanded, there was always a need to escape the chores of the day. There was a secret location of paradise that the youth knew of. Hidden within a hemlock forest, all backwoods trails would lead to Parlor Rock. On a hot summer day you could hear the roar of the water rushing across the rocks. You walk barefoot across the rock and take the plunge into the ice cold New England waters. A simple rope tied to a tree became the most exacerbating thrill known of the period. From the ol' swimmin' hole you can look up at Parlor Rock as it towers up towards the rays of the sun reaching through the hemlock canopy above. A place were you can forget all you worries and commitments. This location will be your secret getaway for you and your friends for all time. As you grow older your found memories of the "rocky parlor" will always follow you. It can be passed to your children, grandchildren and your great-grand children. It will remain a secret for the local residents until 1877. In 1877 the Housatonic RR Company bought thirteen acres of land in northern Trumbull and began to develop a park to be accessible only by train to help stimulate local travel. This area was named after a large boulder on the property known as Parlor Rock Two property transfers show the following: (vol. 11 pg. 411) July 19th, 1877 - John Hurd to Housatonic RR Company a certain piece of land containing 2 3/4 acres more or less known as "Parlor Rock Ground". (vol. 11 pg. 460) June 19th, 1878 - August Weidmen to Housatonic RR Company a certain track of land situated in the Town of Trumbull near "Parlor Rock" so called in quantity ten acres to be there more or less. In the Summer of 1878 this property would be developed and promoted by the Housatonic Railroad first as a picnic ground. This area will then evolve into an unrivalled amusement park within the next 20 years. What Did Parlor Rock Look Like? Parlor Rock was designed to be entered by train. Just north of the Long Hill Station there was a platform approximately 100 feet in length and 5 feet wide. Passengers would step off the train and climb steps about 15 feet in height. At the the top of the steps were fourcroquet fields (30 ft X 60 ft) just to the left of the octagonal shapped dance hall. Croquet was a popular game of the time which consisted of 8 wooden balls painted in 4 colors, 2 stakes and 9 wickets. As visitors to the park climbed the steps to the croquet grounds, they were greeted by a water fountain. This fountain had a large iron bird in the center with a long neck where water flowed form its beak back into the fountain. The fountain was made of bricks and concrete 6 ft in diameter and 2 feet high. Reports have varied of the bird being a swan, stork or crane with a long neck. The brick basin still remains today. No photographs exist of this fountain. To the east of the croquet grounds stood the Parlor Rock Dance Hall. This structure was an eight sided building 60 feet across. North of the croquet grounds brought you to the Main Promenade. Along the promenade were a series of seven small gazebos (6 ft X 7 1/2 ft) with a 10 foot overhang to provide shade. The gazebos were used by picnickers for either eating, reading, resting or chatting. George Beck used the large gazebo (12 1/2 ft X 10 ft) as a refreshment stand. He sold bags of peanuts, slices of watermelon, ice cream and soda. Bananas were dangled by strings from the rafters and nearby branches. A Photogallery on the Main Promenade gave visitors the first opportunity to have tin-type photos made. The gallery was 25 ft x 15 ft.
LOOFF by Charles I. D. Looff of Brooklyn in 1880. DENTZEL by G. A. Dentzel of Philadelphia in 1867. NORMAN & EVANS of lockport, NY in 1898. Most likely one of these companies produced the Parlor Rock Carousel. They were producing steam powered steam carousels and had the ability to ship them along a rail line.North of the Main Promenade was the Parlor Rock Roller Skating Rink. The roller siating rink (100 ft x 60 ft) was made of maple boards. Inside a raised balcony was built around the inside walls for spectators. The maple boards were slanted upright as in a bowling alley. The entrance was at the south end with music at the left of the doorway and soda at the right. This enclosed rink hosted many visiting Roller Polo teams and its off hours also served as a dining hall. Lake High-High was a man-made like prduced by damming up the Pequonnock River. John Radcliff rented rowboats on the lake for 25 cents a day. A trail along the west shore of the lake was refereed to as "lover's walk". It would lead to a comfort station and the site of clam bakes. Further down this trail would bring you to the Parlor Rock Toboggan Slide. A large stone dam was built which produced the lake that Parlor Rock overlookded. As water flowed over the dam, a waterfall was produced where the water would strike the rocky gorge on its way to the bolder known by the name of Parlor Rock. A wooden bridge allowed visitors the opportunity to stand between the waterfalls and the rocky gorge. Steps allowed visitors to travel below the falls to picnic sites. Below the dam was a smaller lake called "Low-Low". Lake "Low-Low" became the ideal swimming area in the long hot days of summer. 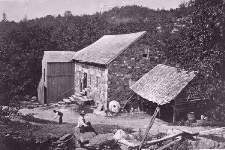 South of Parlor Rock stood Beers'Gristmill on the east shore of the Pequonnock River. A flume tapped water from lake "High-High" and brought water to the mill to produce electricity. Parlor Rock was the first use of electricity in Trumbull. It is reported that a Trumbull resident named Harry A. House who worked with Thomas Edison in 1879, returned with this electrical knowledge to light up Parlor Rock. While the surrounding areas were plunged into darkness, Parlor Rock was a glow with electric lights on the lakes, surging waters and various pavilions. In the Winter of 1888 a Toboggan Slide was added to enable year-round use of the park. In place of Parlor Rock being only a summer retreat, it became a winter wonderland. Iceskating on lake "High-High" by day and at night as electric lights illuminated the lake along with music from the Parlor Rock Dance Hall. Had the roller coaster been invented there is a high probability one would have been placed along Lake "High-High". The next best thing of the era was the Toboggan Slide of 1888. It was 60 ft high with a 300 ft track. In the evenings the slide was operated with lighted lanterns. As soon as you open your eyes you know it's going to be hot. No breeze ripples the bedroom curtains. You can hear a horse wagon clopping very slowly down the street and, beneath your window, your mother and Mrs. Beers next door gossiping quietly over the fence while bees buzz aimlessly around their heads. The air is so heavy and still that breathing takes all your strength. But today it doesn't matter. Today you are going to escape the sweltering sidewalks of Bridgeport for the green groves of Trumbull, to pass up your home cooked meal for a cold picnic on the gress, and to spend the day in the active pursuit of pleasure instead of money. Today you are going to Parlor Rock. You dress quickly, and stuff some money into your pocket. Down in the kitchen you pack your dinner in an old basket, call good-bye to your mother as you bank through the screen door, and set out to meet your friends at the railroad station. There's just enough time to peek into everyone else's picnic basket before going up to the window and putting down two dimes for an excursion ticket. You have a hard time finding seats together on board. The train is overflowing with courting couples, young families, civic clubs, and in the rear car, a boisterous Sunday School class with their stern-faced teacher. But finally ou all settle in the head car, and cheer loudly as the whistle blows and the train pulls out of the station. Through the open windows you watch the city slip by into countryside; wooden farmhouses replace brick factories; and every so often you catch sight of the tail of the train as it follows the engine around a curve. After half an hour you're at the Parlor Rock platform. You leave the train to music, for a church group from New Milford has recently arrived with its own band. But you've got no time to stop and listen. You can't wait to clamber down the wooden steps to the river and sit in the "rocky parlor", to trail your finger in the cool water, and hear the breeze whispering through the trees. Your friends scrable up the stone stairs from the tracks without you. Stashing their baskets in one of the small gazebos, they set off across the sloping lawns toward the promenade. What should they do first? A stroll among the hemlocks? Perhaps a game of croquet--or a whirl on the carousel? You catch up with them at the fountain and, catching the water as it spills from the iron bird's beak, share a refreshing drink from a shiny tin cup. After much debate you decide to go over the bridge and watch the Bridgeport Baseball Team beat Long Hill on the Parlor Rock diamond. The afternoon drifts toward evening. You revel in an icy slice of watermelon form the refreshment stand, and then stop in at the rink to watch some boys noisily enjoying a game of Roller Polo, which looks just like hockey on wheels to you. Finding another quarter in your pocket, three of you rent a rowboat, and spend a happy hour on Lake High-High, splashing swimmers, scaring fish, and spying on couples hoping for privacy on the Lovers' Walk that skirts the water. The day is so grand that you all decide you want a permanent souvenier of it. With the last of your money in hand, you head for the photo gallery. Phe photographer carefully arranges you in a pleasing composition and retires behind his camera. You try not to laugh for what seems to be a very long time, but the torture of keeping still is worth it, for in the end you have a wonderful tintype to take home and show your family. At about 6 o'clock you fall on the picnic baskets, and stuff yourself with cold chicken, tomatoes, cheese, bread, and chocolate cake. The day has made you ravenous, and even while you're eating you wonder if anyone were having a clambake up by the lake that you might drop in on later for a quick snack. By now it's getting dark. Hundreds of electric lights sparkle in the branches overhead. Already the band is tuning up at the dance hall. You pack up your baskets and saunter over to spend the evening waltzing and turning in the soft air, laughing, loving, and dreaming. By the turn of the century Parlor Rock was to fade away. During this era, Trumbull went dry and the park was unable to sell beer. Parlor Rock was built to increase local travel on the railroad. When Trumbull went dry patronage fell of significantly. For the past twenty years the popularity of Parlor Rock increased each year. As much as 3,000 people a day would enter the park. At that time it was more then double the population of the entire town. After Trumbull went dry, the park no longer experienced its peak attendance. This thus defeated the purpose of the development of Parlor Rock Amusement Park. In 1896 the Housatonic Railroad merged with the New York, New Haven and Hartford Railroad lines. A park with a decreasing attendance was not good for the new owners of the Housatonic Railroad. There was also increased competition from other nearby amusement parks such as Pleasure Beach in Bridgeport, Savin Rock in New Haven and Roton Point in Norwalk. In the early 1900's the Pequonnock River waters were diverted by the Bridgeport Hydraulic Company in the development of the Easton Reservoir. During the period of 1907-1908 the facilities at Parlor Rock were dismantled. Roy Eastman reported that in 1907 he saw men loading the skating rink floor on a flat car. It was then moved from Parlor Rock to Brooklawn and Capital to be used as a skating rink. It was then destined to be the dance floor at the Ritz Ballroom in Ash Creek. The seven gazebos were all sold to private individuals. After several drowning in Lake High-High the Railroad Company blew up the dams and drained Lake High-High along with the swimming hole called Lake Low-Low. The most notable legend comes from the Teller Road Boarding House. Families from New York would spend the summer in the Connecticut country side. One summer day in about 1907 a man and three women went out on Lake High-High in a row boat. The boat capsized a good distance from shore. All four people drowned. When this happened, the husband of one of the women came in from New York for the weekend. Upon his arrival he heard of the drownings and then to his dismay, learned that one of the four was his beloved wife. The man then took his rented horse and buggy and traveled full speed back down Teller Road. The driver, buggy and horse lost control and were unable to make the turn, thus plummeted over the cliff at the intersection of Whitney and Teller Road. Surprisingly the driver survived the accident, but the horse had to be destroyed and the buggy was wrecked beyond recognition. Trains continued to stop at Parlor Rock according to a time table dated June 10th, 1908. The Long Hill Baseball Team continued to play at the Parlor Rock field until 1913. In the 1920's there was a coal miners strike. With the decrease in coal aviable for the winter, people were cutting down all the trees they could find. the Railroad Company sold the trees in Parlor Rock. The Hemlocks and Pine trees were cut down throughout Parlor Rock. On January 17th, 1932 the last train will travel through the area known as Parlor Rock. The Railroad is then abandoned. The property was sold the private individuals which removed a good portion of Parlor Rock from public use. In 1978 Route 25 cut through a major section of Parlor Rock crossing the remains of Lake High-High and the Main Promenade. 1981 Trumbull Times article reads "Trumbull Gets Back Old Amusement Park" The old Parlor Rock Amusement Parkland has been turned over to the Town of Trumbull. First Selectman Paul Timpanelli is hoping it can be restored to a picnic and bicycling area as it once was in the 19th and early 20th centuries. The 2.49-acre parcel of land on Riverside Drive was transfered to the town by the United States Department of Interior as excess federal purchase from the 1970's Trumbull Lake Project. Timpanelli also hopes at least some of the past is brought back. Some of the original gazebos are still in existence and it's hoped that interested residents or civic organizations may re-establish several scattered throughout the old park for picnicking. It is also hoped the acquisition will spur the original bikeway plans which incorporated the parcel as a link to Old Mine Park. The First Selectman said "The cost of a bikeway path would be minimal and could be included with the routine woodland path clearing undertaken by the Park and Public Works departments". July 27th, 1997 the Parlor Rock Family Picnic is held at Twin Brooks Park. Parlor Rock is now a wooded area between Old Mine Park and the Pequonnock River Valley State Park. The rock remains along with the railroad grade, the foundation of the fountain and the supports of the bridge. All that is left is the memory and sign. As hikers or mountain bikers travel through this area, they get a feeling that this place has remained undiscovered as in 1877. I hope this page helped explain what was and is Parlor Rock.